First listen to this album was a bit of a shock to my system, seemingly having more in common with melodic ‘pop’ music (something that generally does absolutely nothing for me) than ‘roots’ music! As it progressed it became obvious that this recording is only distantly related to ‘pop’ and in fact despite the warm mellow melodicism it actually has more in common with the roots music that I love so much. In fact, that is the beauty of this pretty much unique recording. With repeated listening sessions it has gradually inveigled itself into my world of ‘roots music’ thanks in part to the subtle instrumentation that adds a little ‘spikiness’ to proceedings. The all round ‘warmth’ of the recording takes it to a hitherto unknown place, certainly to my ears, a place of gorgeous melodies on excellent songs, the warmest vocal style and harmonies you are likely to hear, but, and this is what makes it an exceptional album, there is a barely discernible underlying tension in many of the songs. The consistency of the mellifluous vocals and the subtlety of the instrumentation take the recording from what would be merely a pleasant listen into an album that heavily repays repeated listening sessions. 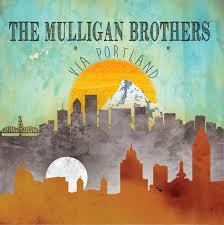 Whilst I have yet to hear their debut album, simply titled ‘The Mulligan Brothers,’ as a follow up ‘Via Portland’ is quite a triumph with it’s lovely flowing sound surprisingly making them pretty much unique in roots music, at least to my ears. The mellow sounds usually lend themselves more to ‘duos’ but The Mulligan Brothers as a four piece have a much more powerful dynamic, which is probably what will endear them to many more roots music aficionados than just me!